Mojy Chian, Richard Cliff, and Jeff Watt have an interesting article at EDN.COM entitled "Achieving First-Time Success at 40 nm" (http://www.edn.com/article/CA6566543.html?text=40+nm), in which they describe how Altera is migrating their FPGA line to the 40 nm process node. The sidebar gives the percentage of ASIC design starts at various geometries, starting from bigger than 0.5 micron in 2002 to projections of 22 nm in 2011. At that point the engineering cost on a bleeding-edge ASIC project will exceed $100 million, a rather horrifying number. 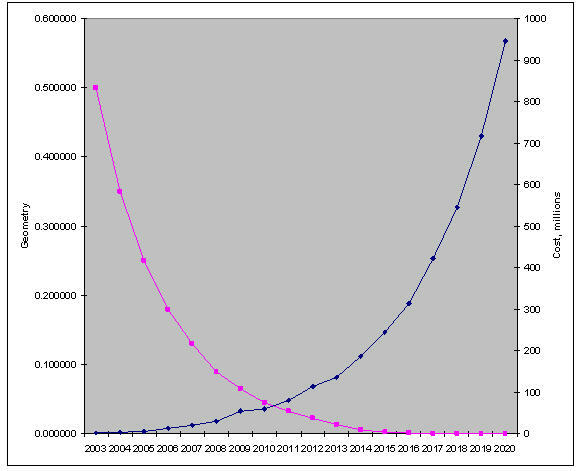 The pink line is the process geometry, and the extrapolation looks like a pretty good match to historical data from the last half-dozen years. Between 2002 and 2008 the effect of Moore's Law is simply stunning. No other industry has achieved any similar sort of improvement in anything over such a short period. After 2014 it's hard to extract much from the graph, but around 2018 this curve predicts features will be about an angstrom across, roughly the size of a single atom. That's absurd, of course, though today gate oxides on some parts are just an astonishing few atoms thick. But clearly something has to happen before we get to that node. It won't be quantum computing because even the optimists figure that's years off. Maybe Moore's Law will finally sputter out. Wags have predicted its demise for years, only to be proven wrong every time. Around the same time engineering costs would, if these trends persist, reach about a cool billion bucks. As Senator Everett Dirksen reputedly said, "A billion here, a billion there, pretty soon you're talking real money." Few products will tolerate $10E9 NRE costs. I carried the projection out further. In about 50 years the cost of just one ASIC project will exceed the United State's current GDP. It'll be a hell of a product, though. Those these numbers are projectio ad absurdum they do show an approaching moment of inflection where some significant change in high-end semiconductors will be required, a change that's revolutionary rather than additional incremental improvements. Some scaling hard limit surely exists, be it the Planck length or, more likely, at the atomic level. And the atomic level just isn't that many years away.